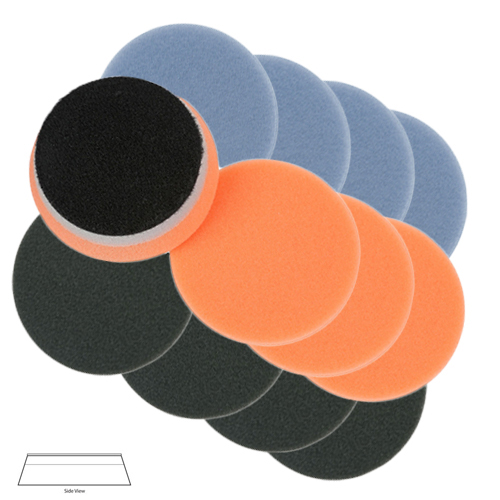 Lake Country HDO 3 1/2" Orbital Foam Pad Mix & Match 12 Pack is a great way to get the pads you need in a one dozen bulk deal. Perfect for your hard to reach and small area cutting, polishing and finishing. Lake Country HDO Foam Pads are a fine cell structure with a firm to medium density for phenomenal cutting, polishing and finishing capabilities. The Lake Country HDO 3 1/2 Inch Orbital Foam Pads have been specifically desnigned from a durable, well balanced slim profile foam for longevity as well as efficiency. All Lake Country HDO Orbital Foam Pads run about 10% cooler thanks to the breathable interface which prevents the center of the pad from caving while polishing by allowing unwanted heat to escape. This breathable interface along with the multi-density layered foam design allows for a smooth feel while maintaining the integrity of the pad for optimum surface contact, stability on flat panels and ability to adjust to contours. Lake Country HDO 3 1/2� Indigo Blue Foam Cutting Pad: Medium to light compounding and heavy polishing. Firm to medium density and fine cell structure for superior cutting ability and fantastic finishing. Lake Country HDO 3 1/2� Orange Foam Polishing Pad: Polishing and finishing on almost all paints. A great one-step pad that can be used for light compounding as well as polishing leaving a swirl free flawless finish. Lake Country HDO 3 1/2� Black Foam Finishing Pad: Final finish polishing even on black, dark, or soft paints and clear coats. This silky foam with a denser body creates the perfect finishing pad. During Use: Use a pad cleaning brush to remove buildup of compounds and from your Lake Country HDO Foam Pads during your polishing process. 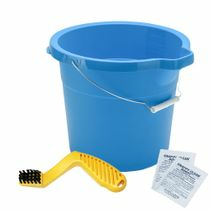 After Use: Wash your Lake Country HDO Foam Pads by hand or in a pad washer with warm water and Snappy Clean Boost Pad Cleaning Powder or a mild soap. You may also wash them by machine with a mild soap and warm water. Allow your Lake Country HDO Foam Pads to air dry or dry on low or no heat in the dryer.